Object Server 01: The database SQLSERVER\INSTANCE is not recognized as a model store. 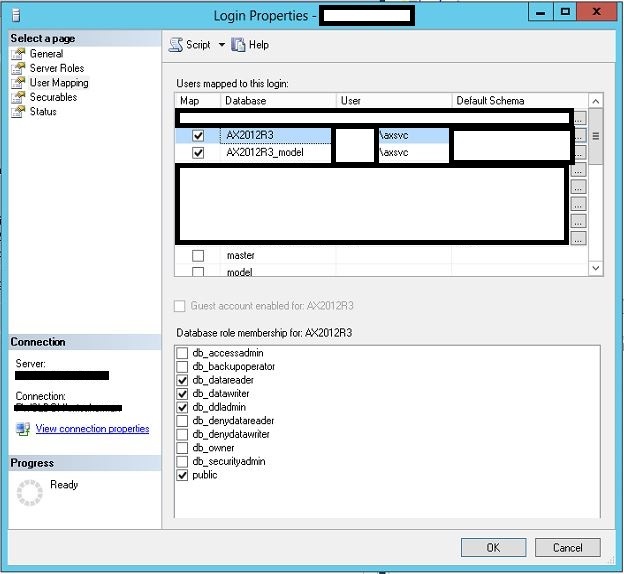 The domain\user will be the service account you are using to run the AX service. Providing this account even with sysadmin on the SQL server will not help you, as the problem is a missing stored procedure on the Master database that is created during the initial AX setup – This stored procedure is missing from your new SQL server and needs to be created manually. BTW – Don’t forget that the AX service account first needs to be added as a user under security logins and granted the db_datareader, db_datawriter & db_ddladmin roles! This entry was posted in Dynamics AX and tagged ax, ax 2012, ax 2012 r2, ax 2012 r3, CREATETEMPDBPERMISSIONS, dynamics, Fatal SQL condition during login, not recognized as a model store on April 16, 2016 by tzooki. As you probably know Microsoft Dynamics AX 2012 R2/R3 does not have a redeployment utility (like the Dynamics CRM deployment manager) meaning that if you want to move an AX Deployment from one domain to another – you’ll have to get your hands a little dirty. 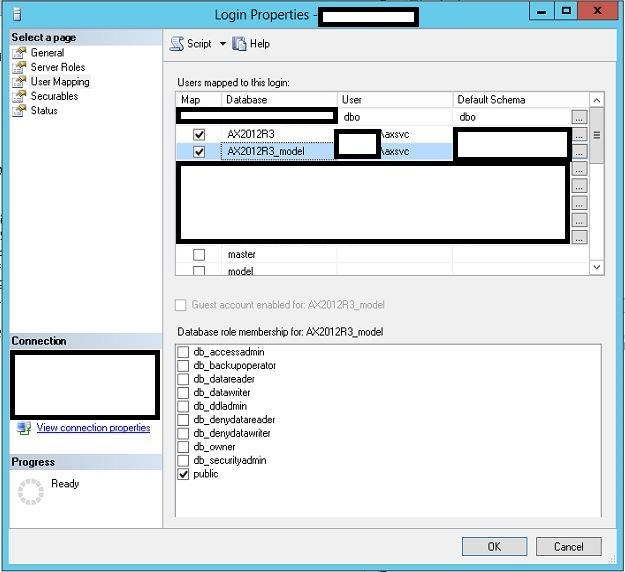 You can use these steps also in AX 2012 – Just ignore the Modelstore database. You can also use these steps to move a deployment in the same domain – ignore step 4. — repopulate the tables with the new server name when the AX service on the new server is started. — later if you want to redeploy the reports. — the redeployment is in the same domain because the old server might be reachable by the new one and may use it as a batch server. 4. Now you need to configure your user in the AX Database in the new domain (You can skip this step if you re-deployed AX in the same domain). Copy the SID to notepad. — users as well, or you can later add new users from the AX GUI. it might take a few minutes for it to start. Once it’s running – you can start the application. any questions – feel free to post them here and i will do my best to help you out. 1. You should synchronize your Database to make sure everything is working properly. I hope you find this post helpful! Good luck, Michael. This entry was posted in Dynamics AX and tagged ax 2012, ax 2012 r2, ax 2012 r3, ax2012, deployment, dynamics, microsoft dynamics, microsoft dynamics ax, migrate, move ax, move ax 2012 database, move database, move database to different domain, redeploy on April 14, 2015 by tzooki.